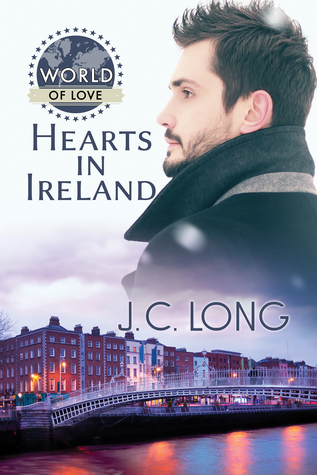 Erryn reviews Hearts in Ireland (World of Love) by J.C. Long, narrated by John Steinkamp, ebook Published May 10th 2017 by Dreamspinner Press, 119 pages; audiobook 3 hrs and 45 mins, published June 25, 2018. A complimentary copy was provided in exchange for an honest review. Why I read this: I was looking for something different and have a strong Irish heritage, so decided on the adventure. To read Melissa’s review of the book, click here. This audiobook had me sniffling within the first couple of minutes and the first few chapters were painful. Losing a loved one is tough and Ronan having to deal with his mother’s passing pulled at my heart strings. The good news is although her death affects Ronan, the story becomes more upbeat, especially when he heads over to Ireland to meet his relatives. His aunt Gwendolyn welcomes him, and his cousin Hannah is thrilled, but it’s Fergal who shows the most interest in this American visitor. This book is a slow burn as the men get to know each other, Fergal playing tour guide, enjoying Ronan’s awe at discovering the history of Ireland. I have to admit, I was a little jealous. Ronan has a good time on his trip and definitely connects with his mother’s roots, but the lack of direction in his life is a challenge. He’s offered a path in Ireland, but he’s scared to take it. Wise sentiments Ronan needs to hear at the crossroads. And this is a happy story with a happy ending, which I loved. In fact, I was tempted to book a trip to Ireland to meet my own family. Ronan’s dad says these words to him and truer words were never spoken. I have listened to John Steinkamp narrate other books and I enjoy his work. His Irish accent works and the performance is enjoyable. Thank you for the review and letting us know to have some tissues close by. I don’t know…I like the appearance of Corgis, but I’m not a fan of their stubbornness, lol. Thanks for the review, sounds like a great armchair travel story!